The spring equinox is next Wednesday, but it feels as if we’re in late April instead of mid-March, due to the unseasonably warm weather we’ve been experiencing lately here in New York City. As much as a small voice in the back of my head keeps telling me that this weather is not normal, it does feel good — at least on a superficial level to be able to shed our winter clothes if only for a week or two. Perhaps this appetizer can put that small, unquiet voice to bed for a little while longer. I love the slightly grassy, hay-like flavor of tatsoi. Substitute chickweed or spinach if unavailable. Drizzle the greens with hazelnut oil (or extra-virgin olive oil) and lemon juice. Taste for salt and pepper. Toss, to ensure that the greens are barely coated with the dressing. I’ve left out proportions intentionally since what is “ideal” varies from person to person. For this salad, you want just a hint of dressing to come through as it’s all about the flavor of the greens. The dressing is there merely to serve as a counterpoint. Combine all ingredients in small bowl. Include any citrus juice if possible. Stir thoroughly, then transfer to a sterilized glass jar and cover. Let the mixture sit undisturbed for at least 1-2 hours, shaking the jar every so often. Use as needed; keeps for a week in the refrigerator. Chop onions coarsely and place in a small bowl. Drizzle with olive oil and vinegar, then add a small pinch of salt. Mix well, then spoon onto a Pyrex baking dish or roasting pan. Bake in a pre-heated 375 F oven for 30 minutes. Remove from heat and let cool. Taste for salt and pepper (you shouldn’t need much), then stir in green garlic. The marinated olives are simply a mixture of Kalamata olives, green olives and Moroccan oil-cured olives that were also marinated with lemon juice, bay leaves and slivered garlic for a couple of days. 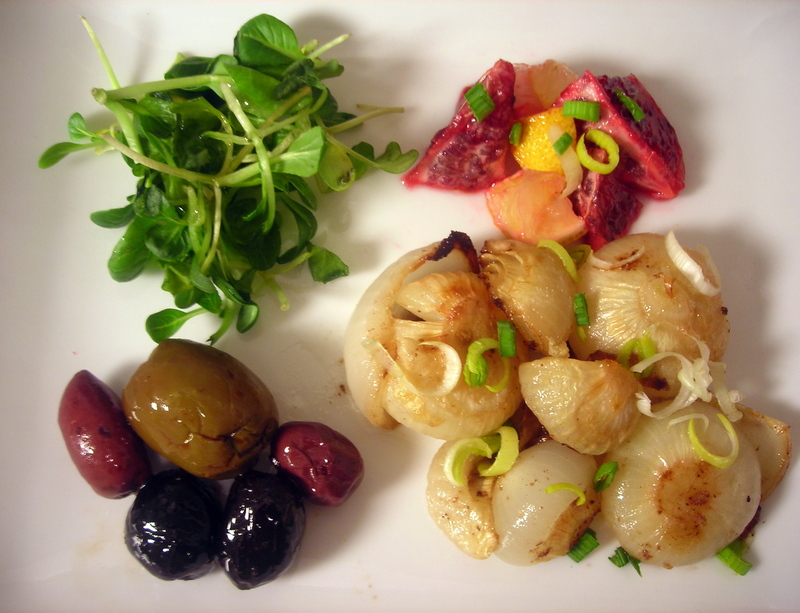 To assemble: Arrange tatsoi salad, preserved orange and lemon and olives attractively on a salad plate. Spoon onions onto plate. Serve immediately. This recipe serves one, so you may have to adjust accordingly if you have additional (ravenous) eaters. Time: About 45 minutes, not including prep. The olives and the quick “preserved” oranges and lemon can be made a day or two ahead. This is my entry for Souper (Soup, Salad and Sammie) Sundays for the week of March 12, 2012 to March 18, 2012, a weekly foodblogging event organized and hosted by Deb of Kahakai Kitchen. 15 Mar	This entry was published on March 15, 2012 at 4:28 am. It’s filed under cooking, food, food photography, Souper (Soup, Salad & Sammie ) Sundays, spring, vegan, vegetarian, winter and tagged appetizer, dinner, food photography, gluten-free, lemon, olives, onion, orange, salad, tatsoi, vegetarian. Bookmark the permalink. Follow any comments here with the RSS feed for this post.